Volvo’s engineers have been keeping themselves busy. With the new XC90 already out and running on the company’s new Scalable Product Architecture (SPA), and the S90 sedan and V90 estate set to follow shortly, here’s what the Swedes have been cooking up using its latest Compact Modular Architecture (CMA). Our spy photographers have managed to capture a test mule of what will become the much-anticipated XC40 compact SUV. Clearly, there isn’t much we can tell you about the vehicle’s exterior styling for now, because rather than use sheets of camouflage to disguise its new looks, the XC40 is seen here wearing the existing body of a V40 hatchback. There are however several telltale signs that help us pin the tail on the XC40. For one, it’s obvious that the amount of ground clearance visible here is significantly a lot more than there was on the V40 range before — not even the V40 on stilts, the V40 Cross Country, has been seen riding this tall before. Having seen the car test mule firsthand, our spy photographers tell us that even the wheelbase of the car is noticeably different from that of the existing V40. A closer look at the rear door reveals a clue to this point. If you look carefully, you should be able to see a seam running down the rear door that suggests the length of the body has been revised in some way to accommodate a different wheelbase. 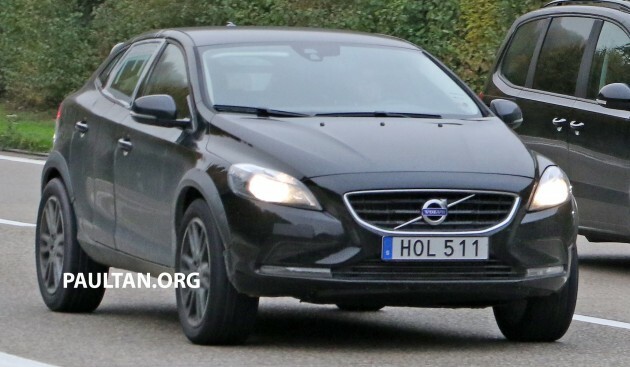 Hopefully, the next time this test mule is spied, an actual V40 is seen around as well, maybe as a support vehicle, for us to make comparisons. When the XC40 does make its global debut sometime in 2017 (as expected for now) the latest addition to Volvo’s range of SUVs will naturally share a lot in common with the next-generation V40 hatchback – we say next-generation because the current V40 as we know it rides on the older, Ford-developed Global C platform. It won’t be until the next-gen V40 comes around that we’ll see it based on the brand’s new architecture. Make no mistake, the XC40 won’t just be a more rugged, higher-riding V40, with “Cross Country” fittings and badges. The new model will be a dedicated compact SUV with ambitions to take on the Mercedes-Benz GLA, the BMW X1, and the Audi Q3. Volvo’s new range of Drive-E petrol and diesel engines are all expected to make their ways into powering the new XC40, with a T5 Twin Engine plug-in hybrid almost guaranteed. With an equal passion for fast cars and everyday workhorses, Chris Aaron maintains a passion for European makes, Formula 1, playing the electric guitar and spending endless hours on the PlayStation - first-person shooters and the Gran Turismo franchise are his favourites. He also finds it strange to have written this in the third person.